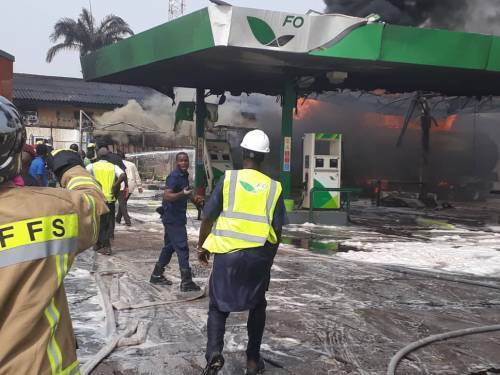 Forte Oil petrol station located inside the Murtala Mohammed Airport, Lagos is currently on fire. At the time of filing this report, the cause of the fire had not been ascertained, as firefighters are currently on ground trying to put out the flames. Staff of the airport told our correspondent that there would have been more damage but for the swift response of Fire Service of the Federal Airports Authority of NIgeria (FAAN). “Officials of the FAAN Fire Service were the first respondents about eight minutes into the incident. The fire was curtailed from spreading to more buildings around it,” a staff member told SaharaReporters.